What do you do when all of your plans go sideways? Picture this: It’s 1990 and you’re in one of, if not the most hotly tipped rock band in the United States. Tons of press, sold out club shows around Southern California and girls lining up as far as the eye can see. And then … nothing. The ride comes to an abrupt halt and you’re left scratching your head and wondering where and how it all went wrong. Such is the story of Los Angeles’ one time favorite sons Black Bambi. The band initially came together when San Diego transplant Steven Ray Anastos left his band City Slick only to discover than another band from his hometown, Aircraft, had also called it a day. Having admired that band’s material, Anastos decided to call guitarist Ronny Jones to see if they might put something together to test the waters and soon after Steven and the bulk of Aircraft were in business as Black Bambi. Playing their first show at The Whiskey A Go-Go on New Year’s Eve 1987, the band ran through a handful of shows before the rhythm section was ousted in favor of bassist John Grimmett and drummer Dave Casey. 1989 would see the band sign with the legendary John Carter at Atlantic Records and they were immediately sent into Enterprise Studios with highly sought after producer Beau Hill behind the board for an album that was scheduled for an early 1990 release. Opening slots with both Badlands and THE Black Crowes followed and BLACK BAMBI were primed for major success. And then the bottom fell out. John Carter left Atlantic Records soon after and suddenly the band had none at the label in their corner. Leaving the label shortly after, they began showcasing for other major labels with everyone having a different vision for the band than they had for themselves. Good things come to those who wait. And you’ve waited long enough. 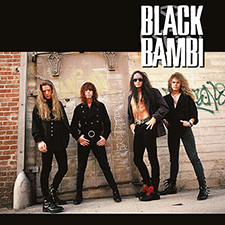 The booklet comes with lyrics, rare photos and “The Black Bambi Story” as told by frontman Steven Ray Anastos.